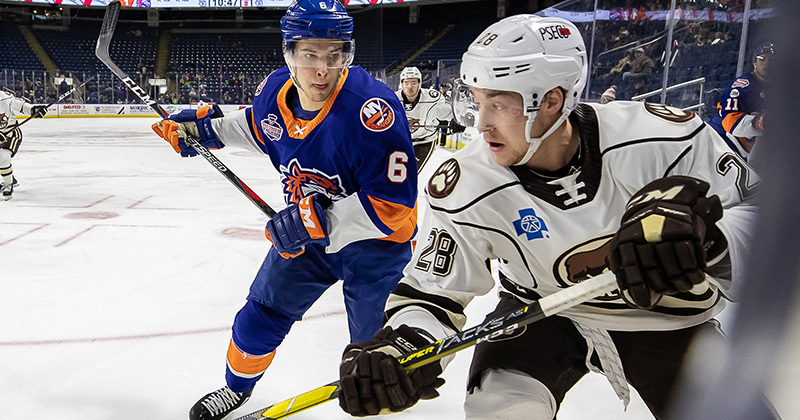 01/21/2019 - The Hershey Bears scored four unanswered goals to beat the Bridgeport Sound Tigers, 4-1 on Monday afternoon at Webster Bank Arena. The victory extended Hershey's season-best winning streak to five games, and rallied the team's record to .500. For the first time since December 22, the Bears were unable to record the game's first goal and trailed, 1-0. On Bridgeport's second power play chance of the afternoon, the Sound Tigers cashed in on a backdoor effort. Former Bears forward Chris Bourque sent a slap pass from the right-point towards the side of the net, and Otto Koivula redirected the puck past Ilya Samsonov at 16:23. Later in the period, the Chocolate and White turned a furious forecheck into a prime scoring chance for Riley Barber. Hard work by Liam O'Brien along the boards in the offensive end allowed Barber to creep uncontested into the center-point with time and space. Barber's snap shot from the high-slot beat Bridgeport goaltender Jeremy Smith at 19:46 to even the score before intermission. Shots after 20 minutes were 9-8 Sound Tigers. Next period, Hershey tilted the ice in their favor and tallied twice to grab a 3-1 lead. More grit by O'Brien in the offensive zone along the half-wall would setup Juuso Ikonen at the net front. Ikonen buried his third goal of the season at 4:28 to provide Hershey a 2-1 advantage. The Bears continuous offensive zone pressure led to a power play after Steve Bernier interfered with Nathan Walker at 8:22. On the ensuing man-advantage, Mike Sgarbossa one-timed a cross-ice pass from Aaron Ness at 9:00 to open a 3-1 cushion. Sgarbossa's goal extended his current point-streak to six games. Shots after 40 minutes were 20-16 Hershey. Into the third period, the Bears added one more insurance tally to secure the 4-1 final. Beck Malenstyn raced into the offensive zone with vengeance to force a turnover. After gathering the puck, Malenstyn's shot attempt was blocked, but the puck took a fortunate bounce to Garrett Pilon. A quick trigger from Pilon marked his third goal of the season at 2:53. The Bears finished the night 1-for-2 on the power play, 3-for-4 on the penalty kill, and with a 29-21 shot advantage. Hershey's record improves to 20-20-0-2 on the season. The Hershey Bears return to action on Wednesday, January 23 against the Lehigh Valley Phantoms. The Bears will look to extend their current winning streak to six games in the same arena where it started on January 12. Puck drop from the PPL Center in Allentown is scheduled for 7:05 p.m. Voice of the Bears Zack Fisch will have the call on the Bears Radio Network.